There are two notable squadmates in Battletech, Glitch and Dekker. Glitch is a delight. She enthusiastically delivers every line, from "Time to die!" to "Missiles away! ", in the exact cadence and tone one would use while stepping forward with jazz hands to say "Let's put on a talent show to save the youth center!" Glitch is the most chipper NPC party member of any game I can recall, and is the first person I take along in every mission. I'd like to bring Dekker into every mission along with Glitch. Unfortunately, he's unavailable more often than not, recuperating from terrible injuries. The patient, callsign "Dekker", was admitted to the infirmary after shooting at an enemy turret power generator building from point blank range. All four of his attacks missed. Dekker, caught up in the excitement, passed out from overstimulation. While traveling between missions, the Captain happened upon Dekker and another 'mech pilot arguing over the last cup of coffee. The Captain granted the beverage to Dekker in the hopes of raising the pilot's spirits after his recent stay in the infirmary. Dekker drank the scalding hot coffee in three greedy gulps, sustaining severe burns to his mouth and throat. During an intense convoy ambush, pilot Dekker stopped his 'mech in a river to disperse the heat built up by his laser weapons. Temporarily forgetting that he was secure in a multi-ton 'mech, Dekker made swimming motions like a dog held above water. The simple arm movement of a butterfly stroke pinched a nerve in his shoulder. Pilot Dekker attempted a rather complex maneuver called Death From Above. In this combat technique, a 'mech engages its jump jets to soar through the air and land with its full weight on an enemy unit. Pilot Dekker somehow missed. Both of his 'mech's legs were instantly broken. The machine toppled over. Surprisingly, Dekker was uninjured at this point. However, when he slammed his cockpit in frustration, he broke all five fingers in his left hand. Patient Dekker stepped out of bed to return to active duty, opening what he thought was the hatch to exit the infirmary, but was in fact a clearly labeled medical waste chute. 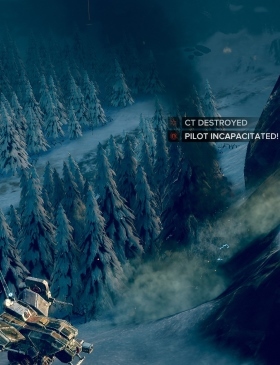 Pilot Dekker hid behind a mountain for an entire mission to stay clear of enemy fire. The cowardly tactic worked. Then the dropship arrived exactly where he had been cowering, crushing his 'mech. Pilot Dekker sustained multiple severe paper cuts while opening his payment of C-Bills, a purely digital currency. Pilot Dekker requested a number of modifications to his light 'mech, removing all armor to free up storage space for explosive ammo surrounding his cockpit. You can guess what happened next. During a mission, pilot Glitch commented that pilot Dekker's planned route resembled a banana peel in their shared heads up display grid. Pilot Dekker's 'mech instantly slipped and fell on its giant metal buttocks. Caught off guard by the sudden jolt, pilot Dekker bit down on his tongue real hard. Pilot Dekker fell for the oldest trick in the book, bending his 'mech over to pick up a giant fake C-Bill Cent left by the enemy. Before the ambush could be sprung, Dekker took himself out of the fight when he lost consciousness due to the extreme tightness of his non-regulation underpants.